Buying a home is one of the most important decisions that you will ever make. A new home can provide a solid foundation for yourself and your family, and it also plays a big role in your financial health. Ideally, a home will help you build net worth and achieve a level of financial freedom. But if you buy a larger home than you can afford, it can become a major burden and source of stress. This may seem obvious, but you'd be stunned at how often homebuyers set a budget and allow themselves to go beyond it. A budget exists for a reason! Going beyond the budget means you are stretching yourself past where you previously felt financially comfortable. I've heard people say, "We're getting a larger and more expensive house because we'll probably make more money in the future." This thinking is foolish and possibly disastrous. You or your spouse may never get that raise you were counting on. You may lose your job entirely. And that baby on the way? Well, you just found out you are having twins. It's impossible to predict your future income and expenses with any real accuracy. So when budgeting for a home, take a conservative approach based on your current income, and assume that expenses will rise if you plan to start or expand your family. Taking a conservative approach will give you wiggle room to save money, invest, and eventually pay off that house completely. There are some key advantages to putting a sizable down payment on a home. For one thing, the more you put down, the less you'll have to borrow, so you'll start off with a larger piece of equity in the home. Putting more money down also likely means a lower interest rate, and less in interest payments overall. In addition, if you don't place 20 percent down, most lenders will require you to purchase private mortgage insurance (PMI), thus adding to the cost of your loan. Interest rates are still quite low by historical standards, but you can end up with higher rates if banks think you are a risky borrower. If you have high debt, a low credit score, or both, you may end up with a higher-than-average interest rate, and that likely means your monthly mortgage payment will be higher. If your interest rate seems high, it's time to take a step back and examine why. It could be that your finances aren't in good shape, or you could be trying to buy a house that's too costly. It has the perfect yard. It's on a perfect street at the end of a cul-de-sac, and the school district is great. It's even got a breakfast nook. It's expensive, but it's your dream home. Your dream home could become a nightmare if you allow your emotions to be your only guide. Buying a home is ultimately a financial decision, though we often turn it into an emotional one. 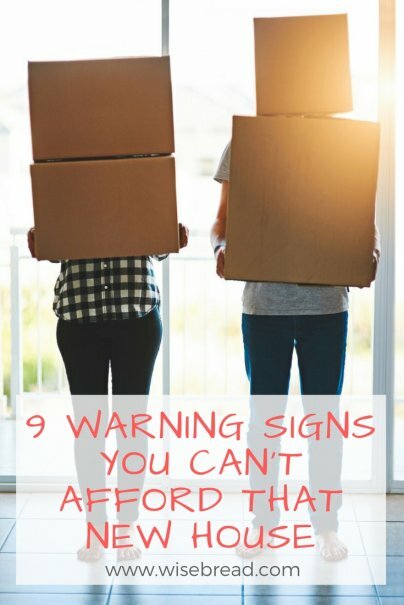 The finished basement, the two-car garage, and the granite countertops aren't going to seem so special when you have trouble making the monthly payments. It's perfectly fine to have certain criteria in mind when searching for a home. But affordability should be a big part of that criteria. There are many different mortgage products out there. The most common type of mortgage is one in which you place a certain amount of money down, and obtain a loan with a fixed interest rate, paying it back over an agreed upon term (usually 15 or 30 years). But sometimes, you may not qualify for a fixed-rate mortgage. When this happens, banks will often offer different kinds of loans. These can include adjustable rate mortgages, in which interest rates may start low but increase at a later date. Or they may be negative amortization loans, in which the amount owed actually grows larger over time instead of shrinking. These different kind of loan products were popular about 15 years ago, but were a large driver of the collapse of the housing bubble because they allowed people to purchase homes they ultimately could not afford. If you are buying a home with a nontraditional mortgage — or if you don't understand the mortgage terms to begin with — you may be taking on more house than you can handle. When you are applying for a mortgage, banks will often tell you that you've been approved for a mortgage up to a certain amount. It's important to remember that this is the maximum amount that you can borrow, not a guideline of what you should spend. In fact, the actual amount you borrow should never be close to that maximum. Banks are more conservative now than in the past, but still are likely to approve you for a loan that is larger than what you can comfortably afford. Don't get too excited about what the bank says. Just set your own budget and stick to it. For nearly 50 years, the U.S. government has suggested that renters and homeowners pay no more than 30 percent of their income in housing costs. This is not a requirement or law, but it is a helpful guideline for determining if you may be overburdened by a mortgage or rent payment. For people with average incomes, 30 percent is a good target to stay under, because anything higher begins to strain your ability to meet other expenses and save for the future. If you have a high income, you may be able to afford to spend more than this. But for most of us, 30 percent is a good rule of thumb. If you find that buying a home would put you over this threshold, consider looking for a cheaper house. In addition to the 30 percent guideline, the federal government also looks at another figure to determine your worthiness for a loan. When banks examine whether to approve you for a loan, they will add up all of your debt (including credit cards, auto loans, etc.) and compare it to your income. If that ratio is more than 43 percent, you may not be approved for the loan. And if you are close to that threshold, you are truly living on the edge financially. If you find that your debt-to-income ratio is on the high side, consider backing away from buying a home immediately. Take time to pay off your other debts and boost your income, if you can. By entering the home buying process with a lower debt-to-income ratio, you'll be less likely to find yourself in a house you can't handle financially.